West Coast cabin – Clayoquot Sound, B.C. 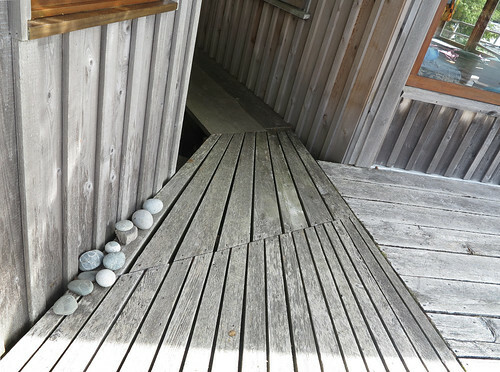 The cabin is probably the true vernacular architecture of British Columbia’s West Coast and other parts of the Pacific Northwest. Vancouver must once have had some of these buildings, thought rampant demolition and ugly development are doing their best to eradicate any trace of this architectural past. All that’s left of the cabin is the practice of attaching big cedar decks onto the imported Victorian and Edwardian and Britishy styles that sadly crowd the housing stock where I live. 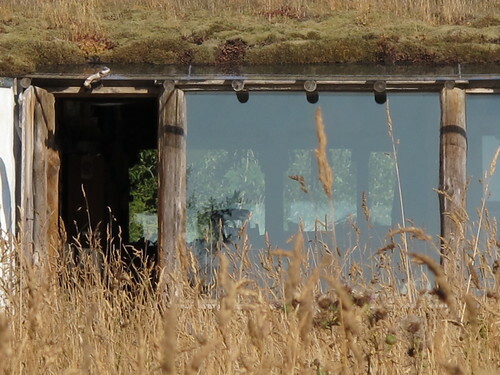 These photos of Ron Thom’s Boyd House are from the blog Architecture Wanted which provides a good introduction to this house. Also see a great post by Cam McLellan on his Vancouver Lights blog and an article in Western Living by the house’s current owner, Kerry McPhedran. Recent radio silence has been the result of being either too busy in the city, or too unbusy and computerless while on various islands. Today I learned that the term dog days is very old, a translation from the latin dies caniculares. It refers to “the hottest, most sultry days of summer in late August. Look, Vancouver, Victoria retained its cedar modernism. You could have, too. 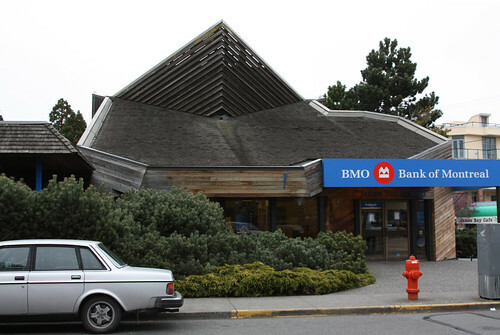 Bank of Montreal branch in James Bay, Victoria, BC. Too bad about the sign. If you’re in Vancouver and are interested in Arthur Erickson’s ties with Japan (and by extension Japan’s influence on west coast modernism), it’s worth ordering tickets for this event now. It will sell out. It’s not cheap, but there’s a good deal for students. The event is co-presented by Coast Modern, the upcoming film about modern architecture on the west coast from Vancouver to LA, by filmmakers Gavin Froome and Michael Bernard.